Oxygen is getting pumped into Earth's liquid outer core. BOSTON — Earth's vast magma oceans, roiling deep beneath our feet, seem to be pumping oxygen into the planet's liquid core. And that oxygen is shaping earthquakes and volcanoes all over our planet. That's the conclusion of a body of research University College London physicist Dario Alfe presented Tuesday (March 5) here at the March meeting of the American Physical Society. Though it's impossible to observe oxygen in the Earth's core directly — thousands of miles of hot rock impede that view — Alfe and his collaborators used a combination of seismological data, chemistry and knowledge about the ancient history of our solar system to draw their conclusions. The main bit of evidence that something like oxygen is hiding out in the iron core? Earthquakes. The rumblings we feel on the surface are the result of waves that move throughout our entire planet. And the behavior of those waves offers clues to Earth's contents — almost like an ultrasound of the whole planet. 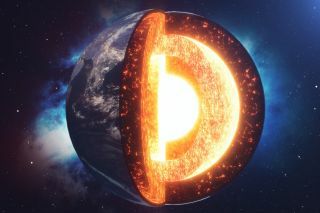 "If the core was pure iron, the density contrast between the solid inner core and the liquid [outer core] should be on the order of 1.5 percent," he said. "But seismology tells us it's more like 5 percent." In other words, the outer core is less dense than it should be, suggesting there's some non-iron element mixed in, making it lighter. So that raises the question: Why would the lighter element be mixed in with the outer core but not the solid inner core? When atoms are in a liquid state, they flow freely past each other, making it possible for a mixture of different elements to coexist, even in the extreme environment of the inner Earth, Alfe said. But as extreme pressures force the inner core into a solid state, the atoms there form a more rigid lattice of chemical bonds. And that stricter structure doesn't accommodate foreign elements as easily. As the solid core formed, it would have spat oxygen atoms and other impurities into its liquid surroundings like toothpaste shooting out of a squeezed tube. "You see a similar effect in icebergs," he said. When salt water in the ocean freezes, it expels its impurities. So icebergs end up as chunks of solid freshwater floating over the sodium-rich ocean. The research team ruled out other elements, like silicon, that might theoretically be present in the core based on the makeup of that cloud but don't explain the observed effect. Oxygen was left as the most likely candidate, he said. Further, the levels of oxygen theoretically present in the core seem lower than what chemistry would predict based on the oxygen contents of the mantle. That suggests more oxygen is probably getting chemically pumped into the outer core even today from the more oxygen-rich mantle surrounding it. Asked what the oxygen in the core looks like, Alfe said not to imagine bubbles or even the rust that forms when iron bonds directly to oxygen. Instead, at those temperatures and pressures, oxygen atoms would float freely among iron atoms, creating buoyant clumps of liquid iron. "If you take a parcel of liquid that has 90 iron atoms and 10 oxygen atoms, this parcel will be less dense than a parcel of pure iron," and so it will float, Alfe said. To help confirm these results, Alfe said he's looking forward to the results of efforts to measure neutrinos formed in our planet and radiating out toward the surface. While "geoneutrinos" are very rare, he said, they can offer a lot of information about what specifically is going on in the planet when they do turn up. But without any way of directly accessing the core, physicists will always be stuck making their best possible judgments about its makeup from limited, secondary data.